The 2016 Summer Olympics is making the world fall in love with host city Rio de Janeiro, one of Brazil’s most coveted destinations. Whether spending the day beachside in Ipanema or walking the steep, winding hills of the Santa Teresa neighborhood, travelers are flocking to this year's Olympic host city for reasons that span larger than the Games. For your ultimate guide to Rio de Janeiro, I've teamed up with Sidewalker Daily (@sidewalkerdaily), a global community of stylish women traveling the world. From tanning at the beaches of Copacabana to climbing to see the Christ the Redeemer statue, explore Brazil's tropical paradise city with Sidewalker Daily, one photography location at a time! Best known for its luscious landscape, breathtaking views and colorful city life, discover why Rio de Janeiro is the perfect, one-stop destination to experience Brazilian culture. Pedra do Pontal is known for its birds-eye view of the Recreio dos Bandeirantes neighborhood in West Rio de Janeiro. The combination of ocean, cityscape, and mountains makes Pedra do Pontal a perfect backdrop to capture your memories! Karla Gordilho de Campos, a Rio de Janeiro local, is pictured at the top of Pedra do Pontal. Rio de Janeiro’s Botanical Gardens - also known as Jardim Botânico - are located at the foot of the iconic Corcovado Mountain and home to over 6,000 native and tropical species. Rows of towering palm trees greet you at the entrance and hidden gems are found throughout this tropical secret garden. Be sure to check out the lake with giant water lilies or stand below the arches with whimsical greenery for a dreamy photo-opp that you will need to frame! Leslie Anne Murphy is one of our favorite Sidewalkers and travel bloggers at The Road Les Traveled. You may recognize her from her appearance on The Bachelor, but within the travel community - she is a go-to source for everything travel and fashion related. Here she is pictured on the Avenue of Royal Palms upon entering the Botanical Gardens. 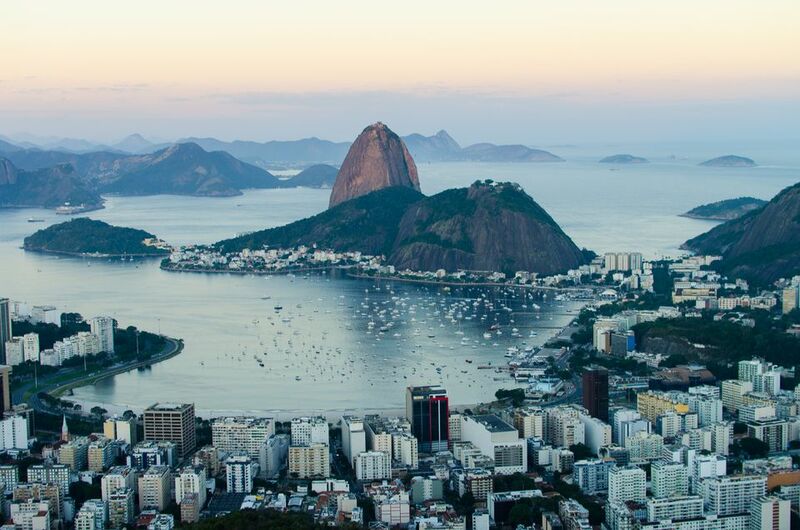 Located at the mouth of Guanabara Bay, Sugarloaf Mountain is Rio de Janeiro’s most renowned peak. In order to capture this iconic Rio locale, snap a photo with this natural beauty in the background or hitch a ride on the cable car system to avoid the climb. If you make it all the way to the top, you’ll be rewarded with panoramic views of the city, including the famous beaches of Ipanema and Copacabana. Fun fact: These cable cars are celebrating their 104th birthday this year and have become an integral part of the city’s landscape. Marmoura is pictured with Sugarloaf Mountain in the background. The mansion is now the home of Escola de Artes Visuais do Parque Lage, a renowned school for visual arts in Rio de Janeiro. Due to its clout, the area attracts the city's leading artists, curators, and thought leaders that seek to expand the city's connection with creativity. Additionally, because of its close proximity to the forest, you may catch monkeys or toucans lounging within the trees, offering the perfect marriage of art and nature. With stunning architecture, a courtyard pool and a luscious natural backdrop, this is one of photography location not to miss in Rio de Janeiro. Ashley Calloway and friends are pictured in front of the former mansion. Lapa is mostly known for its raucous late-night scene in the hills of Rio de Janeiro. Home to some of the city's best nightclubs and dance institutions, Lapa attracts travelers from far and wide. When not exploring the neighborhood at night, the Lapa Arches are a daytime photography spot not to miss. Located in the center of the city and reminiscent of Roman architecture, the Lapa Arches date back to the mid-1700s. The chic white arches are more than just a pretty sight, as they were originally built as an aqueduct to bring fresh water to the city. Now, they serve as a bridge for the local tram. Brazilian street-style star, Alana Ruas, knows a photo worthy location when she sees one. Here she is pictured in front of the Lapa Arches. The Museum of Tomorrow is a futuristic science museum located on the waterfront of Pier Mauá. Designed by Spanish architect Santiago Calatrava, the building incorporates eco-friendly design elements throughout the space. The Museum of Tomorrow sets itself apart from other science museums as it focuses on the importance of sustainability and the immediate need to act now on climate change. The Museum of Tomorrow’s architecture is stunning: You can find a reflective pool, gardens and bike paths around the property. Marianna Henud is pictured on the back side of the Museum of Tomorrow near the water. Just as Henud, make sure to roam all angles of the museum. Each view of the iconic spot offers a different photography element. Explore and find the right ethos for your shot. The Niterói Contemporary Art Museum is located across the Guanabara Bay in the city of Niterói. Designed by Oscar Niemeyer, the spaceship building was completed in 1996 and is one of Rio de Janeiro’s most famous landmarks. Perched on a cliff, the museum has views of Rio de Janeiro’s city center, Sugarloaf Mountain, and the serene Guanabara Bay. You might recognize the spiraling red walkway from Louis Vuitton’s recent fashion show, which was hosted at the Museum. Laís Gomes is pictured in front of the Niterói Contemporary Art Museum. The Selaron Stairs are some of the most famous steps in the world. Located between the colorful Lapa and Santa Teresa neighborhoods, the 215 colorful steps are covered in tiles collected from all over the world. The mastermind behind the Selaron Stairs is Chilean artist Jorge Selarón, who considers the staircase to be an ever-evolving piece of art. If you want to capture the stairs without other tourists in the mix, make sure to get to the staircase early, as this is a favorite spot for all visitors to the city. For even more intimate access to the steps, you can also opt to stay at one of the many small boutique hotels that line the stairs. Mareen Schauder, travel blogger from Miss Everywhere, is pictured on the heart of the Selaron Stairs. It’s no surprise Frank Sinatra was mesmerized by the “Girl from Ipanema” - can you blame him? As one of Rio de Janeiro’s most popular beaches, you’ll be sure to find locals and tourists soaking in the rays or playing beach volleyball and soccer. Ipanema is an extra special photography location, as the Dois Irmãos mountains at the West end of the beach stand tall. Snap a photo on the sand or head up to the rooftop pool of the Praia Ipanema Hotel for a panoramic shot of the sunny paradise. Photographer and Sidewalker Daily muse, Zhanna Bianca, is pictured on the rooftop pool of Praia Ipanema Hotel. In 2001, The Christ the Redeemer statue was placed as one of the New Seven Wonders of the World (which begs the question: what took them so long?) The symbolic statue of Jesus is located at the top of Corcovado Mountain and towers over 124 feet high. Overlooking the city of Rio, the Christ the Redeemer statue is visible from almost every part of the city. Laila Loves, voted in 2015 as UK’s Top Travel Blogger never disappoints. Here she is pictured in front of the Christ the Redeemer statue.